The Dorr Hotel will add 40 rooms in downtown Sister Bay adjacent to CHOP restaurant. 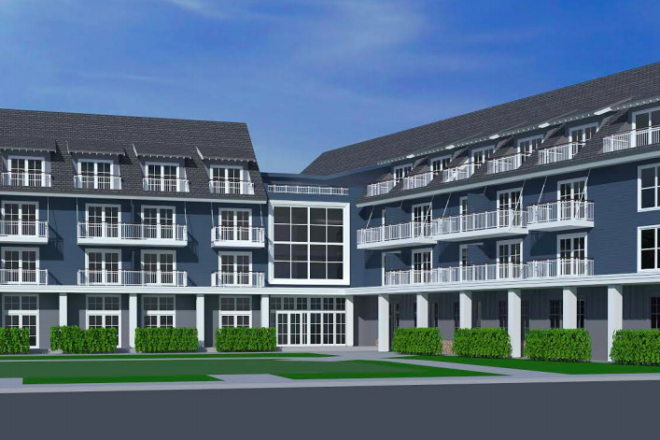 The Village of Sister Bay approved the development agreement with Jaco Management for construction of a 40-unit hotel, The Dörr Hotel, on the vacant lot at the corner of Bay Shore Drive and Mill Road, south of CHOP restaurant. Chris Schmeltz, owner of Jaco Management, said he brought back a new design for the structure after getting feedback from village officials and residents. “We got a lot of feedback from the first rendering when it went out and it wasn’t good,” Schmeltz said. Although he had approvals for the structure already, Schmeltz went back and redesigned the building to address some of the comments that came up. The reconfiguration will also create approximately 30 new parking spaces in addition to the 40 that already exist on the property. Construction is expected to start later this year, with a completion date slated for June 2020. The village did impose restrictions on when construction can take place in the summer and during weekends in the shoulder seasons. Phase two of the project will include development on three lots immediately adjacent to Bay Shore Drive, and one more lot on Mill Road, which are expected to be dedicated to retail. Construction on phase two of the project is expected to begin in the fall or winter of 2019 and be completed in June 2020. The village also approved the development agreement for a four-unit hotel condominium at the corner of Bay Shore Drive and Sunset Drive. Schmeltz and Allen Gokey, a familiar name in Sister Bay’s recent building boom, are the developers for that project.